Under the Sales Settings section, add the desired discount percent amount in the Discount field. From the drop down list, choose a Discount Type, or click on the button to add new or edit an existing type. A system generated calendar entry is created for customer follow up (in days) after the customer is invoiced. 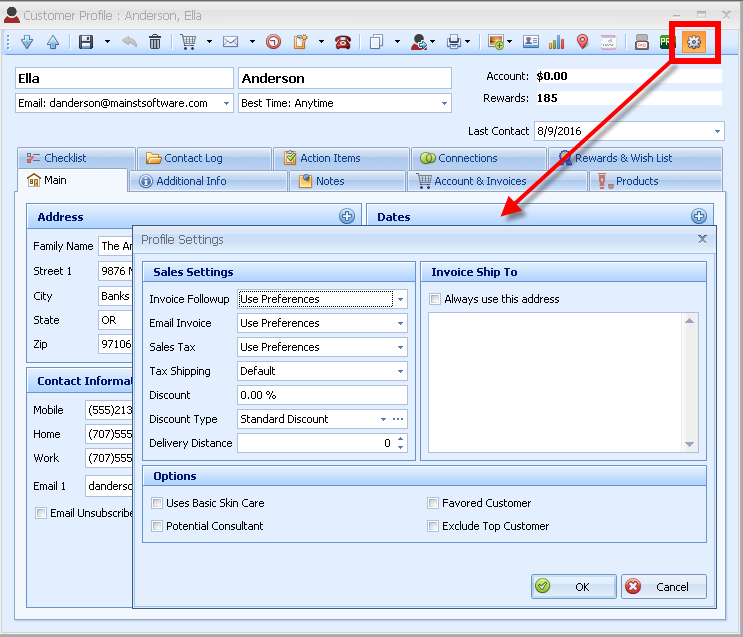 Choose whether the customer prefers the invoice to be emailed an invoice copy when an invoice is generated. Set a custom sales tax rate that is different then what is used in Preferences. Specifies whether tax is calculated on shipping. Enter a default discount percentage given when invoiced (this amount can be overwritten on the invoice). Choose the default type of discount given to the customer. Default is set to Standard. Other default types include Standard, Personal Use (or Own Use*), Native Indian*, Hostess Credit, Birthday/Anniversary, or Business Supplies. The default types cannot be deleted, however additional types can be created. Set the delivery distance to be used when creating a trip log entry. Specify a shipping address for product to be delivered that is different from the address set in the Main tab of their profile. Mark whether the customer regularly uses one of the basic skin care lines. Mark whether the customer is a potential consultant. Ability to mark and place in a favored customer group. Set this option to not include this customer in the dashboard's Top Customers listing (usually used for personal use and business supplies profiles).